Oshine comes with a comprehensive options panel that lets you control every single part of the theme. With 500 google fonts and fine color controls customize the theme to your liking or simply use one from our 12 demos. 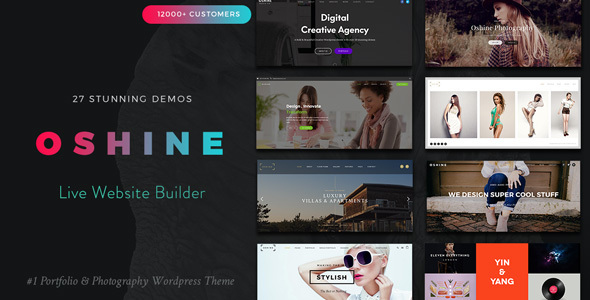 Oshine comes with over 10 different header layout combinations, 5 menu layouts, 3 body layouts & 3 footer layouts, which you can combine in any manner. Oshine comes packaged with this amazing premium slider plugin worth $19. Stunning layered css3 transitions and over a dozen different starter templates, makes this the hottest slider plugin in the market. Oshine comes with sample content data and an one click import feature to help you get started easily by setting up your site like any of the demos you like. You can mix and match layouts and pages. Choose between masonry, medium or large thumbnail layouts and play with title & meta variations to arrive at the best way to present your blog. Easily add parallax sections to enhance the visual appeal or create full screen parallax sections to build stunning web pages. Oshine is tightly integrated with this popular ecommerce plugin to help you setup a clean and modern shop in no time. The theme is fully localized and we have tested the theme completely with this popular multi-lingual plugin to help you easily translate to your website. We have also been rated as one of the best photography wordpress themes of 2015 in the reputed ColorLib.com collections. 1. Images seen in the demo are not available in the sample import data as they have licensed and cannot be redistributed. They have been replaced with other free to use images. - Removed duplicate Navigation Dots when both Scroll to Section and Single Page Version settings were used. - Fixed Installation of Included plugins issue when child theme was active. - Keyboard shortcuts for Save, Undo, Redo, Delete, Duplicate, Cut , Copy & Paste Actions. - Back to Dashboard setting made prominent - UI change and opens in the same tab. - Fixed Black Bars issue in Vimeo Videos. - Scroll to the location of the Section when it is added. - Added support for EDITOR user role. - Fixed Tinymce images editor issue. - Fixed Blog Masonry Layout issue, when gallery (image slider) post format is clicked. - Fixed Gallery Lightbox issue - Magnific Popup style which supports video wasn't taking effect. 12. Background Color Option for Accordion Toggle? 1. Option to add Gallery Information as First Slide in Ribbon and Centre Slide Carousel Gallery. It is mandatory to update both the Theme and Be Page Builder plugin to latest versions for seamless functioning. 1. Option to add Background Color to Mobile Menu Icon added. 3. New “Split Screen Left and Right” Page Templates added. Demos showcasing this feature to be added soon. 1. Section Offset Feature added. Demos showcasing this feature to be added soon. 7. Issue with Scroll to Sections when Hero Section is not used in the Page. 1. Issue while using single slide in Testimonial, Tweet, Image Slider, Content Slider modules. - Revamped Sample Content with Lighter Blurred Images for a faster and streamlined import process. It is recommended that you backup your database or atleast your Options Panel before performing the theme update. 6. Remove images limit in Gallery Template Options Meta Box, previously restricted to 100. 3. Partial support for default WordPress Gallery shortcode. It is mandatory to update both the Theme and Be Page Builder plugin to respective latest versions for seamless functioning. 5. Upgraded the Portfolio Navigation Module in Page Builder to use the specific HOME url link and CATEGORY TRAVERSAL option from Portfolio Metabox option. 7. Fixed the issue with Portfolio Items getting duplicated on Infinite Scroll/Load More. a. Drag and Touch Swipe Gesture. - Contact form default height issue. 1. Fixed - Search not scanning page builder content bug. 2. Fixed - Instagram Gallery feed of a different user bug. Note - Updated version of plugins are included in the theme. Oshine Child Theme is updated - 1.2 - Code Snippet to restore Default WP Gallery shortcode provided. The code is commented and can be used if needed. 2. Options Panel CSS printed inside <head> instead of separate file. - Enhanced Speed. 3. Optimized File Inclusions, unwanted / outdated scripts removed. 3. Woocommerce Country & State Dropdown issue. 4. Woocommerce Social Sharing Warning. 6. Revolution Slider v17 modified sample import file. 1. Newsletter Module default First Name & Last Name issue. 3. Firefox Column Overflow issue. 3. Theme One Click Updater implemented. Easy One Click Updates will be possible in subsequent updates, after saving the Purchase Code under Appearances > Oshine Purchase Code. 6. Double Width and Double Height option added for Images in Media Library. This can be used in Gallery Module in Page Builder. 1. Photoswipe Lightbox Implemented which has Social Sharing option on each image. 3. Double width and Double Height options for Gallery Items. Note - Updated version of BE Page Builder and Revolution Slider is included. Make sure you update and activate the latest version using our Plugin Auto Update feature (for BE Page Builder). 1. API Key error that was occurring due to Google Maps module is fixed. 2. Latest version of Revolution Slider is included. This is an important update from the plugin authors that is related to security issues. Latest Version of Master Slider(2.12.2) and BE Page Builder(1.8.1) plugins are included. This is a vital and mandatory update for MasterSlider plugin. Note - Updated version of BE Page Builder and MasterSlider is included. Make sure you update and activate the latest version using our Plugin Auto Update feature (for BE Page Builder). 3. Lightbox in Portfolio modified to open only the corresponding thumbnail and not all Images on the page (that are attached to Lightbox). 2. Pause Vimeo when moving from slide to another in both full screen sections, Portfolio sliders and gallery page template. 1. Pause Vimeo when moving from slide to another in both full screen sections, Portfolio sliders and gallery page template. 4. Theme made compatible with latest Woocommerce plugin version - 2.3.4. Note - Updated version of MasterSlider plugin is included. Note - Updated version of BE Page Builder and MasterSlider is included. Make sure you update and activate the latest version using our Plugin Auto Update feature. Oshine Child Theme is updated. Buyers using the child theme, should update the child theme as well. 1. Oshine Child Theme made compatible to create translations using ‘CodeStyle Localization’. 2. Function to enable ‘WPML language switcher’ short code is included. 3. Single blog page issue fixed in cases where ‘No Sidebar’ is chosen for main blog page. 1. PHP Parse error in BE One Click Import plugin fixed. Note - Updated version of BE Page Builder, BE One click import, Master Slider and Slider Revolution plugins are included. Make sure you install and update the latest version. 3. Option to enter custom ‘Aspect Ratio’ for portfolio thumbnail Images. BE One Click Import - Updated plugin, with new demo data.